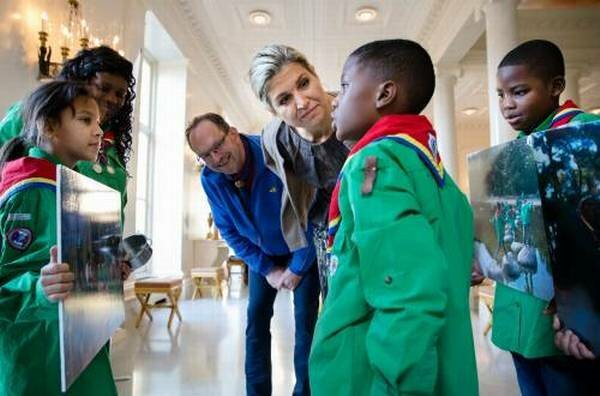 On December 6, 2016, Queen Maxima of The Netherlands meets with scouts at Noordeinde Palace (Paleis Noordeinde) in The Hague, Netherlands. 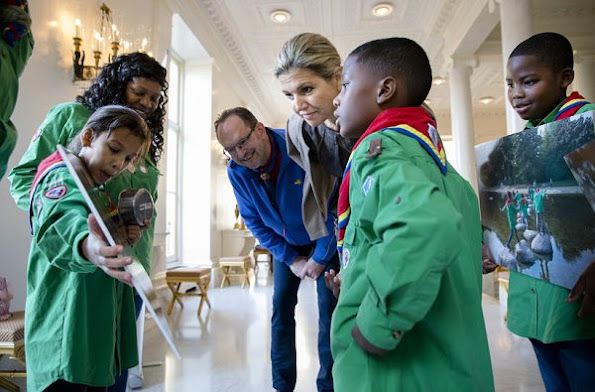 The Queen talked to the supervisors on projects of Scouting Netherlands and the social role they play. This seems too low key, even given that it must have been a simple event for children. The dress and jacket are okay and I like the subdued colours, but her hair and no makeup, and not even earrings? She's looking a little washed out ! I don't care if it is down time or not. Down time means no photos to be released. She looks not so good. Hair is a mess. Not one bit of make up. She is the Queen and she should at least look somewhat fresh. I am shocked. It is like she rolled out of bed and opened the door. Although I agree that she looks a bit unkempt here, I actually think that the kids don´t care one bit about mascara or lipstick. They get to meet the queen, and as long as she is nice and welcoming and caring and engaging, everything is fine. And for the record, I´m sure Maxima is wearing make-up here; usually she has too much on, and I´m convinced that we´ll never see her without. No need to be shocked. She is a woman like most of us after all. Agree! Lipstick and tidier hair, and a small pair of earrings would have made so much difference. It's her job and usually we make an effort when we go to work. 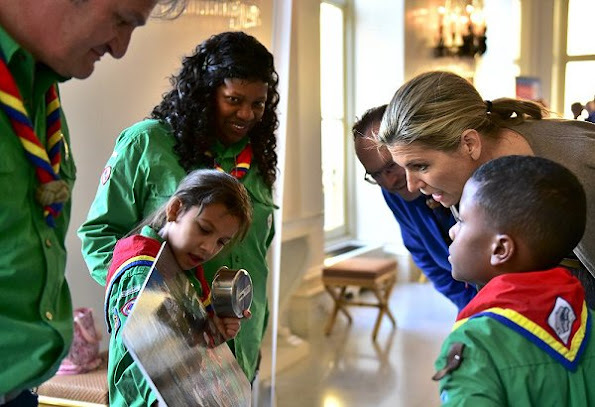 Maybe she felt it was not important to get dressed up and look nice for the Scouts :( I agree with Diane and Heather. She should have made an effort. She looks terribler. Not her best day, that is for sure. In addition to the lack of makeup, the dress does not fit her well. Gelukkig een gewoon doordeweeks gezicht, niet mooi en niet lelijk.